Join Jaqui and Glynis in exploring the acrobatic side to AcroYoga. Come and participate in a long weekend of solar /fire generating indulgence. We will encourage you to play to your acrobatic potential. 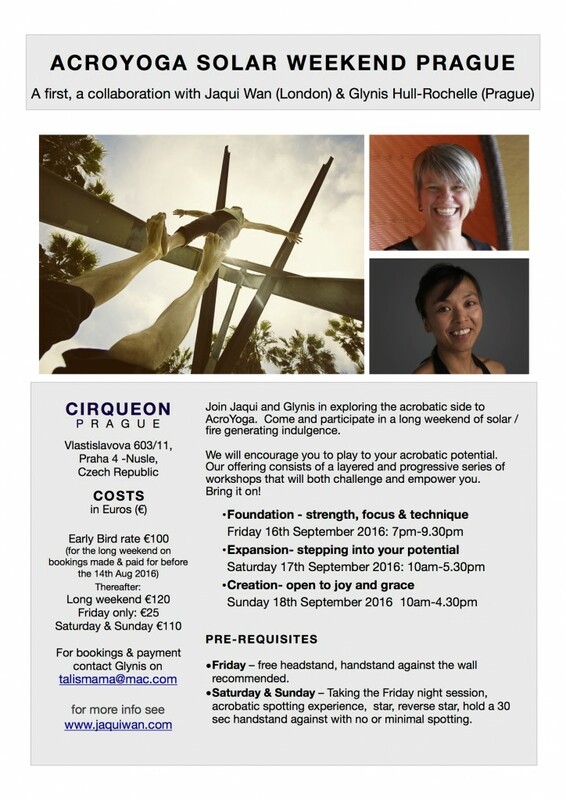 Our offering consists of a layered and progressive series of workshops that will both challenge and empower you. 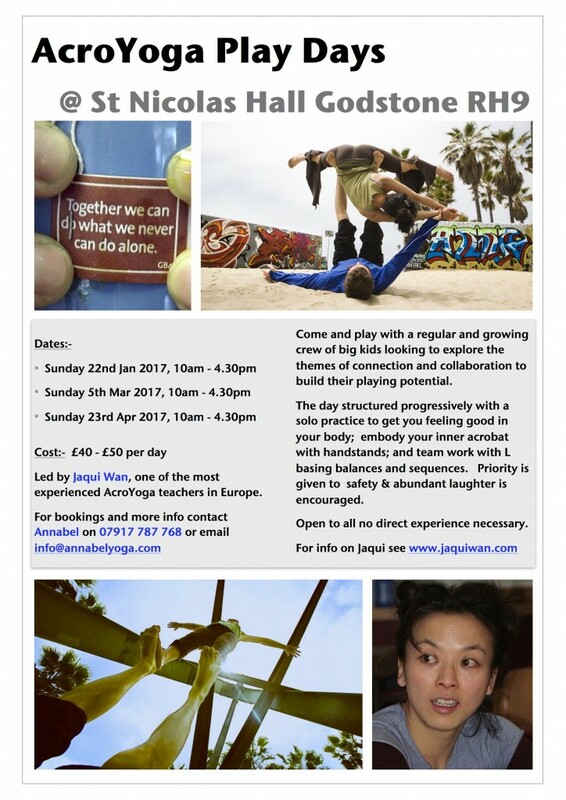 Turn your world upside down with inversions, reviewing the foundations of acrobatic balancing in a safe environment and building confidence. Special focus on spotting – a crucial skill for what we have in store for you this coming weekend! Alignment and strength are the building blocks to inversions and acrobatic balancing. Inspiring trust and clear communication through games and group exercises, we wil form tight trio teams and take a leap from basics to complex partner acrobatics! Taking a step higher, we will perform complex flying transitions, washing machines and acrobatic tricks, engaging our creativity, fluidity, compassion, honesty and mutual support to perfect artistic expression and presentation. Friday – free headstand, handstand against the wall recommended. Saturday & Sunday – Taking the Friday night session, acrobatic spotting experience, star, reverse star, hold a 30 sec handstand against with no or minimal spotting. This fire ball of a person is full of enthusiasm and energy that it make me wonder if she’s actually human. She has extensive practical teaching experience of body movement. She will have completed her AcroYoga Montreal teacher training over the summer and I’m super excited to be co-teaching with her. I unearthed a shiny acrobatic gem last year at the Berlin convention when I met her. She is one of the original certified AcroYoga teachers in the world and has helped spread the practice over the past decade across her native UK and beyond. Don’t be fooled by her petite frame – she can base just like a muscleman! Full of energy, flexible, creative, humble, warm and funny she will give you new insights into your practice and take your acro skills up a notch or two. Cost: £40 early bird rate or £50, bookings are made with Annabel Broom.